• financial repression—that is, official policies that direct to government use (and usually at below-market rates) funds that would otherwise go to other borrowers (see Box 1). Financial repression occurs when governments implement policies to channel to themselves funds that in a deregulated market environment would go elsewhere. Policies include directed lending to the government by captive domestic audiences (such as pension funds or domestic banks), explicit or implicit caps on interest rates, regulation of cross-border capital movements, and (generally) a tighter connection between government and banks, either explicitly through public ownership of some of the banks or through heavy “moral suasion.” Financial repression is also sometimes associated with relatively high reserve requirements (or liquidity requirements), securities transaction taxes, prohibition of gold purchases, or the placement of significant amounts of government debt that is nonmarketable. In the current policy discussion, financial repression issues come under the broad umbrella of “macroprudential regulation,” which refers to government efforts to ensure the health of an entire financial system. Because these debt reduction channels are not mutually exclusive, debt reductions have often combined more than one of these avenues. Financial repression played an important role in reducing debt-to-GDP ratios after World War II, and it has recently reemerged, along with large increases in public debts, in advanced economies. Financial repression is most successful in liquidating debts when accompanied by a steady dose of inflation, and, like inflation alone, it only works with debts denominated in domestic currency. Low nominal interest rates help reduce debt servicing costs, while a high incidence of negative real interest rates liquidates or erodes the real value of government debt. Inflation need not take market participants entirely by surprise and need not be very high (by historical standards). We suggest that the large public and private debts in advanced economies and the perceived dangers of currency misalignments and overvaluation in emerging markets facing surges in capital inflows are interacting to produce a “home bias” in finance and a resurgence of financial repression. While emerging markets may increasingly look to financial regulatory measures to keep international capital out, advanced economies have incentives to keep capital in and create a captive domestic audience to finance the existing public debt. Concerned about potential overheating, rising inflationary pressures, and related competitiveness issues, emerging market economies are altering their regulatory frameworks to deter foreign investors in their eternal quest for higher yields. This offers advanced and emerging market economies a common ground to agree on increased regulation and/or restrictions on international financial flows and, more broadly, the return to more tightly regulated domestic financial environments—in other words, financial repression. Governments do not call these actions financial repression, of course, but characterize them as part of “macroprudential regulation,” which is designed to ensure the overall health of the financial system. One of the main goals of financial repression is to keep nominal interest rates lower than they would be in more competitive markets. Other things equal, this reduces the government’s interest expenses for a given stock of debt and contributes to deficit reduction. However, when financial repression produces negative real interest rates (nominal rates below the inflation rate), it reduces or liquidates existing debts and becomes the equivalent of a tax—a transfer from creditors (savers) to borrowers, including the government (Reinhart and Sbrancia, 2011). But this financial repression tax is unlike income, consumption, or sales taxes. The rate is determined by financial regulations and inflation performance, which are opaque compared with more visible and often highly politicized fiscal measures. Given that deficit reduction usually involves highly unpopular expenditure reductions and/or tax increases, authorities seeking to reduce outstanding debts may find the stealthier financial repression tax more politically palatable. Liberal capital market regulations and international capital mobility had their heyday under the gold standard prior to World War I. But they began to wane after World War I, with the Great Depression and World War II putting the final nails in the coffin of laissez-faire banking. After World War II the Bretton Woods arrangement of fixed exchange rates and tightly controlled domestic and international capital markets was put in place. The result was a combination of very low nominal interest rates and inflationary spurts of varying degrees across the advanced economies (which here include Australia, Belgium, Canada, Finland, France, Germany, Greece, Ireland, Italy, Japan, New Zealand, Sweden, the United Kingdom, and the United States). 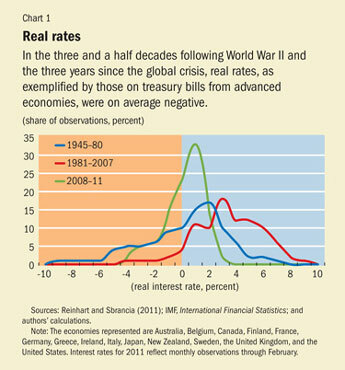 Real interest rates in both advanced and emerging economies were markedly negative—whether on treasury bills (see Chart 1), central bank discount rates, deposits, or loans—and remained consistently lower (negative on average) in the ensuing three and a half decades. Binding interest rate ceilings on deposits (which kept real deposit rates even lower than the negative real rates on treasury bills) induced domestic savers to hold government bonds. That this was occurring nearly everywhere at the time helped delay the emergence of leakages from investors seeking higher yields. Although another era of freer capital mobility began around 1980, the outbreak of the recent financial crisis again sent real interest rates in advanced economies increasingly negative. In the past four years, real rates in 21 advanced economies have been negative about half the time and below 1 percent about 82 percent of the time. This overall turn to lower real interest rates occurred despite the high rates investors have demanded on securities in several countries that have been teetering on the verge of default or restructuring. Real central bank discount rates and bank deposit rates have also been markedly lower since 2007. Undoubtedly, a critical factor explaining the high incidence of negative real interest rates was the aggressively expansive monetary policy (and, more broadly, official central bank intervention) in many advanced and emerging economies during the crisis. This raises the broad question of the extent to which current interest rates reflect the stance of official large players in financial markets rather than market conditions. A large role for nonmarket forces in interest rate determination is a key feature of financial repression. In the U.S. Treasury market, the rising role of official—that is, U.S. or foreign central bank—players (or, conversely, the shrinking role of private or outside market players) is made plain in Chart 2. 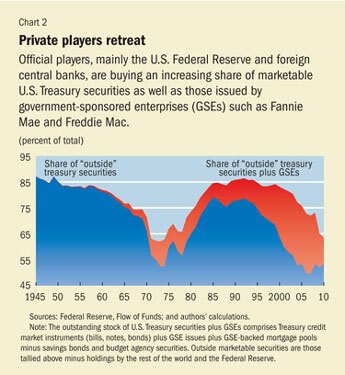 It shows the evolution of the share of outside marketable U.S. Treasury securities plus securities of government-sponsored enterprises (GSEs) such as Fannie Mae and Freddie Mac from 1945 through 2010. Outside securities are essentially those that are not held by other governments or the U.S. Federal Reserve. The combination of Federal Reserve purchases of securities and, more importantly, record purchases of U.S. Treasury securities and GSEs by foreign central banks (notably China, but also emerging Asia and other emerging economies) has left the share of outside marketable treasury securities as of 2010 at nearly 50 percent of the total issued without GSEs and about 65 percent when GSEs are included. This is the lowest share since the expansive U.S. monetary policy stance during the breakdown of the Bretton Woods system in the early 1970s. The post–Bretton Woods era (like the present) was one of rising oil, gold, and commodity prices, negative real interest rates, currency turmoil, and eventually higher inflation. The situation is similar in the United Kingdom. The Bank of England’s quantitative easing policies since the crisis (in which the central bank bought U.K. government debt, as well as other financial assets), coupled with the October 2009 requirement that commercial banks hold a higher share of U.K. securities (gilts) to satisfy tougher liquidity standards, have reduced the share of outside gilts to about 70 percent of the total outstanding. If foreign official holdings (by central banks) were added, the share of outside gilts would be considerably lower and closer to that of the U.S. treasury market. The European Central Bank (ECB) bond purchases of debt issued by Greece, Ireland, and Portugal totaled more than $100 billion between May 2010 and March 2011 and account for about 12 percent of the combined general government debts of the three troubled sovereigns. Central banks have become bigger players than ever in purchases of government debt—a situation that could continue for the indefinite future. Fear that their currencies will appreciate (with attendant ill effects on international competitiveness) drives central banks in many emerging markets to purchase U.S. government bonds on a large scale. In other words, markets for government bonds are increasingly populated by nonmarket players, calling into question the information content of bond prices relative to their underlying risk profile, which is a common feature in financially repressed systems. We quantified the post–World War II wipeout of mountains of public debt in the advanced economies by measuring the so-called liquidation effect, the amount of government debt reduction wrought by financial repression (Reinhart and Sbrancia, 2011). To determine how much debt is liquidated by financial repression requires reconstruction of a government’s debt profile over time. Such a reconstruction is needed because of the complicated structure of government debt, which varies enormously across and within countries over time. The overall cost of debt financing for the government is shaped by differences in coupon rates, maturity and the distribution of marketable and nonmarketable debt, and securitized debt versus loans from financial institutions. The reconstructed debt portfolio must reflect the actual shares of debt across the range of maturities as well as the shares of marketable versus nonmarketable debt. It also must include calculating an aggregate nominal interest rate and a real interest rate (adjusted by the consumer price index). A year in which liquidation occurs is one in which the real rate of interest on the portfolio is negative. This is a conservative definition. A more comprehensive definition would include periods where the real interest rate on government debt was below a real market rate. This definition captures the savings to the government from having a negative real interest rate on government debt. These savings can be thought of as a revenue equivalent for the government, which, like regular budgetary revenues, can be expressed as a share of GDP or as a share of recorded tax revenues to provide standard measures of the liquidation effect across countries and over time. The savings (or revenue) to the government from the liquidation effect are equal to the real (negative) interest rate times the tax base. The tax base in this case is the stock of domestic government debt outstanding. 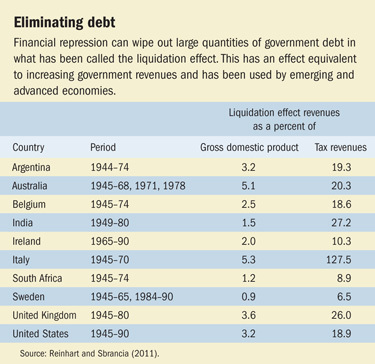 The liquidation effect occurred in at least a quarter of the years between 1945 and 1980 in the United States and considerably more often in other countries (see table). The magnitude of savings to the governments was often large and never trivial. For the United States and the United Kingdom, the annual liquidation effect amounted on average to between 3 and 4 percent of GDP a year. Annual deficit reduction of this magnitude quickly accumulates (even without any compounding) over the course of a decade. For Australia and Italy, which recorded higher inflation rates, the liquidation effect was larger (about 5 percent a year). These estimates, which are conservative, highlight the significant role played by financial repression on debt reduction during the decades after World War II. One thing advanced economies have in abundance today is government debt, with the attendant policy challenge of finding prospective buyers for it. As noted, massive purchases of government debt by central banks around the world have kept nominal and real interest rates low. In addition, the latest international bank regulatory standards (Basel III) encourage banks to hold government debt by giving it preferential treatment for satisfying capital requirements. Other approaches to creating or expanding demand for government debt may be more direct (see Box 2). For example, at the height of the financial crisis U.K. banks were required to hold a larger share of gilts in their portfolio. 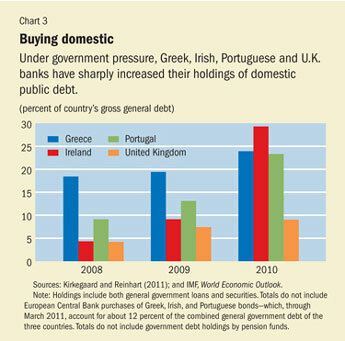 Greek, Irish, and Portuguese banks have already liquidated a substantial fraction of their foreign assets and used the proceeds to buy domestic public debt (see Chart 3). Thus the process by which debts are being placed at below market interest rates in pension funds and other more captive domestic financial institutions is already under way in several European countries. Spain has recently reintroduced a de facto form of interest rate ceilings on bank deposits. Similar trends are developing in Eastern Europe. Moreover, the use of capital controls by emerging markets hoping to control destabilizing inflows (hot money), potential overheating, rising inflationary pressures, and related competitiveness issues have found far greater acceptance in the international community than at any time since the breakdown of the Bretton Woods system. Indeed, many emerging markets have already begun to use such policies. France, 2010: Conversion of a pension reserve fund to a captive buyer of French official debt. The French government liquidated the Fonds de Reserve Pour Les Retraites (FFR), designed to provide long-term financial support to the pension system, and shifted the €37 billion FFR to paying an annual €2.1 billion to the government agency Caisse d’Amortissement de la Dette Sociale (CADES) from 2011 to 2024. In 2024, all remaining assets in FFR will be transferred to the CADES. This has meant a radical shift in FFR’s asset allocation from longer-term to shorter-term instruments and, for the duration of its lifespan, made the FRR a large captive buyer of French government bonds. Ireland, 2010: Use of the national pension reserve to recapitalize banks. As a result of the banking crisis, Ireland’s National Pension Reserve Fund (NPRF) may have to contribute up to €17.5 billion to recapitalize Ireland’s banks. The NPRF was set up in 2001 to help finance the long-term costs of Ireland’s social welfare and public service pensions after 2025. However, a 2010 law directed the NPRF to invest in Irish government securities and provides the legal authority for the Irish government to fund capital expenditure from the NPRF during 2011–13. The Irish government also proposed funding jobs programs through a 0.5 percent levy on private pension funds. Japan, 2010: Reversal of privatization of Japan Post and an increase in deposit ceilings. The new government reversed the 2007 plan to privatize Japan Post, the nation’s post office that also runs such a massive savings system that it is the world’s largest financial conglomerate, with more than ¥300 trillion in assets. The new law also doubled the amount that depositors can save at Japan Post Bank to ¥20 million and raised the life insurance coverage limit at Japan Post Insurance Co. from ¥13 million to ¥25 million. Because Japan Post traditionally allocates roughly 75 percent of its assets to Japanese government bonds, and because consumers are likely to transfer deposits to a company certain to enjoy a government guarantee, the reversal of the Japan Post privatization increases the capacity of a captive customer of Japanese government debt. Portugal, 2010: Transfer of the previously privatized Portugal Telecom pension scheme back to the Portuguese government. The government was immediately able to book €2.8 billion in extra revenues, about 1.6 percent of gross domestic product. As a result, the Portuguese government narrowed its 2010 budget deficit sufficiently to appear to be in line with annual European Union deficit reduction targets. Spain, 2010: Interest rate ceilings on deposits. The Ministry of Finance required institutions offering deposit interest rates the ministry determines to be above market rates to double their contributions to the Deposit Guarantee Fund. United Kingdom, 2009: Increase in required holdings of government bonds. The Financial Services Authority required U.K. banks, investment banks, and subsidiaries or branches of foreign institutions to hold more high-quality government securities and cut their reliance on short-term funding by 20 percent in the first year alone. 2011: Royal Mail privatization. The U.K. Treasury is projected to receive a transfer of £23.5 billion in assets ahead of privatization and £29.5 billion in liabilities. Since 2008, many emerging market countries have taken one or more steps to control the flow of foreign capital into their economies, including Brazil, 2008, 2009, and 2010; Czech Republic, 2008; Hungary, 2011; Indonesia, 2010; Korea, 2009, 2010; Peru, 2009, 2010; Philippines, 2010; Poland, 2011; Russia, 2010, 2011; South Africa, 2010; Thailand, 2010; and Turkey, 2010. Sources: Kirkegaard and Reinhart (2011); and Magud, Reinhart, and Rogoff (2011). Evaluating the relative merits of these highly diverse policies is beyond the scope of this article but certainly warrants further research. Carmen M. Reinhart and Jacob F. Kirkegaard are Fellows at the Peterson Institute for International Economics, and M. Belen Sbrancia is a graduate student at the University of Maryland. Kirkegaard, Jacob F., and Carmen M. Reinhart, 2011, “The Return of Financial Repression in the Aftermath of the Great Recession,” forthcoming Peterson Institute Working Paper (Washington: Peter G. Peterson Institute for International Economics). Magud, Nicolas E., Carmen M. Reinhart, and Kenneth S. Rogoff, 2011, “Capital Controls: Myth and Reality—A Portfolio Balance Approach,” Peterson Institute Working Paper 11-7 (Washington: Peter G. Peterson Institute for International Economics, February). Reinhart, Carmen M., and Kenneth S. Rogoff, 2010, “From Financial Crash to Debt Crisis,” NBER Working Paper 15795 (Cambridge, Massachusetts: National Bureau of Economic Research); forthcoming in American Economic Review. Reinhart, Carmen M., and M. Belen Sbrancia, 2011, “The Liquidation of Government Debt,” NBER Working Paper 16893 (Cambridge, Massachusetts: National Bureau of Economic Research, March).